The Soyombo alphabet was created in 1686 by the famous Mongolian monk and scholar Zanabazar. Modelled after the Lantsa-Dewanagari script, it is capable of representing Mongolian as well as Tibetan and Sanskrit. He has took some ideas from Indian, Lanzish Scripts. This letter was very hard to write for this reason it had not developed among the people. But the head letter became all Mongolian symbol. In this head letter includes all other letters mean feature. The Sansicrid word Soyombo Zoldi means the light which was born itselfand it includes itself many symbol of religion, philosaphy and politics.Under the Soyombo there has drawn soil, water, fire, air, sky, which in orient philosaphy thinks they are the preface of the universe. And middlecy the Soyombo there has drawn humans method which means inside of the universe. 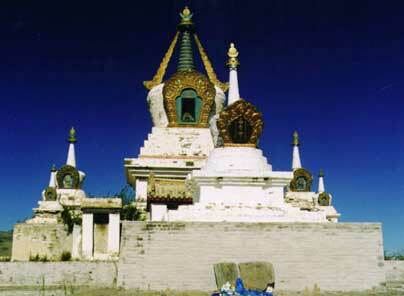 Zanabazar (1635-1723) the first Jebtsundampa Khutuktu, was one of the great figures of Mongolian Buddhism. The high priest Zanabazar was born in 1935 as a first son of the Tushetu Khan Gambodorji (1594-1655), one of the three territorial chieftains or khans of the Khalkha, it was prophesied even before birth that he would be a future leader of the Khalkha. His early childhood was attended by miraculous events, and he was given the name Under Gegeen, which means "High Brilliance" and referred to as the "Brilliant Child." Examined by a soothsayer, he was found to have all the marks of a Buddha on his body. Zanabazar was enthroned as a Living Buddha and Head of the Faith in 1639 at a great meeting of the Seven Banners of the Khalkha. Educated in Mongolia until 1649, he then was sent to Lhasa to receive a Tibetan education under both the Dalai and Panchen Lamas, including higher ordinations from the Dalai Lama, who bestowed upon him at the age of 15 the title Jebtsundampa. Zanabazar was renowned as an outstanding scholar and a sculptor, and was reputed to have magical powers in addition to his fine intellect. Tantric Buddhists also emphasized the importance of lineage, because they believed the only sure introduction to tantric methods was with the help of a guru, whose experience was needed to guide the initiate along a spiritually dangerous path. Thus consecrations were passed from guru to disciple, creating lines of revelation that were spun back into antiquity, to the time of Shakyamuni himself. (2) These lineages of spiritual descent were reinforced in Tibet when the concept of reincarnation was first introduced in the fourteenth century. 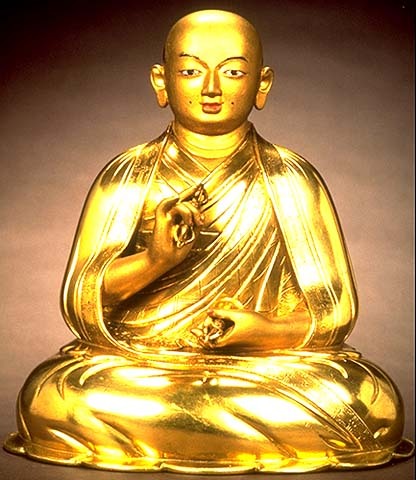 Incarnate lamas not only possessed the authority gained by studying with established adepts, they embodied the idea that the Buddha's doctrine was passed on even without instruction, transcending death. One of Zanabazar's large sculptural projects was his series of Green Tara and her twenty-one manifestations, four pieces of which are seen here. The entire set represents the Taras invoked in "Twenty-One Verses in Praise of Tara," part of the Tara Tantra. Like many Tibeto-Mongolian Buddhist deities, Green Tara, a goddess of compassion, has both benevolent and wrathful aspects. Of these four, no. 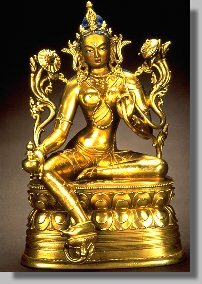 106 is easily identified as Ekajati, also called Black Tara, a fierce emanation of Tara who holds the chopper and skull cup. The other wrathful Tara (no. 105) is identified by an inscription on the base as "the seventh Green Tara," who destroys enemies' magical powers. The benevolent Tara of no. 103, whose form is harmoniously framed by lotuses, has a seated Amitabha Buddha in her crown, an iconographic feature of Avalokiteshvara, Lord of Compassion. More mysterious is the peaceful deity (no. 104), who is notably masculine in appearance with a thicker waist and lacking the prominent breasts of the other four figures. This Tara is perhaps Avalokiteshvara himself, Tara's male counterpart.